2,810 sq ft of garages! View deck on the lake-side. 106′ covered patio on the lake-side. Initially constructed at corner of Firefly and Cabana, C-2 on your map. 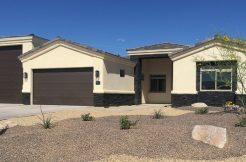 ALLOWANCES for Kirk, Lema, Caesar Place, Mediterranean, Pena Lane, Kiowa Bay, Firefly: $35,000 cabinets; $18,000 granite counters; $12,000 tiled showers; $12,000 exterior brick; $5,000 bath accessories; $4,000 appliances; $4,000 light fixtures/fans; $7,000 front door; $7.00 psf flooring in living areas; $2,000 underground electric; $4,000 security/electronics; $10,000 driveways; $10,000 landscaping. $1,000 Euro finish in foyer. 8’ high garage doors with openers. Thermidor termite pre-treatment and pest proofing. Not Included; lot, grading, surveys, pool/walls/fencing/decking, evap coolers, blinds, furniture, wall decorations. Prices subject to change. 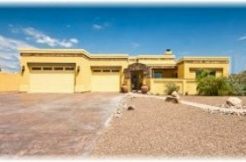 OPTIONS AVAILABLE: Decorative concrete, exterior floor tile, patio-pool deck finishes, furnishings, window coverings, extra bedrooms and baths, bigger garages. House, patios, garages are all expandable. We’ll do our best to give you the design and changes you want. Kitchen and breakfast area designed for informal entertaining next to a great room. Big 8′ entry/interior doors, large window walls. Walk-in tiled shower. A sauna in some models. Granite kitchen-bath counters, textured wall finish w/ low-sheen paint & accent walls. High ceilings, big and bold interior structures. Pantry, niches, large allowances and upgrades included in base price. 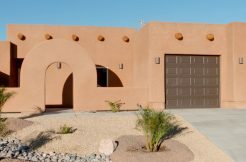 For various types and colors of stucco, see finishes. For various types and colors of roof tile, see roofs. ENERGY STAR UPGRADES BY DBU: The basic Energy Star program featured by other builders includes a 14 SEER AC unit, R38 attic insulation, R19 sidewall batts, with standard roof sheeting. However these DBU’s Luxury models are upgraded to a; 15 SEER AC unit, R50 attic insulation, R21 sidewall batts, and LP Tech Shield with VaporVents™ roof sheeting. Click on Energy Star specs DBU for the details. Included in DBU’s upgraded energy package are; 410A refrigerant, digital thermostat, efficient air filters, Low E dual pane vinyl Alside performance series windows, 1” exterior foam, air barrier poly-sealing (doors, windows, bottom plates, and penetrations), split batts, sealing of return/supply cans and R6 flex ducts, advanced framing techniques to DOE OEV standards, Energy efficient hot water heater, low flow toilets, low VOC emission paints and carpets, and blower door and duct blaster testing with HERS inspection and rating for the Energy Star certificate. SolaTube units on some models. See Luxury Home specs. KITCHEN & BATH CABINETS: We recommend Kitchen & Bath Concepts or Bob’s Cabinets for Aristokraft products. DBU customers have also selected cabinets from Custom Counters and Cabinets, Tri-Pacific, and Accurate Measures. With these firms, DBU will help you with kitchen design details and cabinet and counter selections. This is important because each home is unique in its own way and deserves a special touch that sets it apart. Our design professionals have the skills and experience to offer unique cabinets, countertops, sinks, faucets, and trim that can define your DBU home and give it those singular qualities you are seeking. For appliances, we recommend City Maytag. This is a local business that has the same products offered by Lowes or Sears. But, City Maytag is smaller, locally owned providing excellent service and support. KITCHEN & BATH COUNTERS: The more popular and best quality granite kitchen and bath counters are carried by Desert Floors, Kitchen & Bath Concepts or Bob’s Cabinets. DBU customers have also selected counters from Tri-Pacific, Accurate Measures, and Custom Counters and Cabinets. The best counter options include granite slabs or granite tile. Another option as is ceramic tile. Some people prefer solid counters such as CaesarStone, SileStone, or Hi-Macs. Granite slab counters (3 CM, std edge, 6” back-splash) start at about $53 to $59 (2CM) psf & up. Granite tile counters (mud float, edging, 6” backsplash) start at about $32 psf & up. Ceramic tile counters ($1.49 tile, mud float, edging, 6” backsplash) start at about $25 psf & up. APPROXIMATE DIMENSIONS: 3,150 sq. ft. Living Area, 1,610 sq. ft. Garage, 1,200 sq. ft. RV Garage, 1,140 sq. ft. Covered Patios, 360 sq. ft. Covered Porch, 7,460 sq. ft. Under Roof. 130′ wide, 64′ deep, minimum RE lot 150 ‘x 114′. Minimum R1 lot 140′ x 114’. Square foot dimensions include the outer skin of foam/stucco, which is the method of measurements for appraisals and taxes. Dimensions approximate. Check our luxury home plans for Caesar Place, Kiowa, Firefly, Breakwater, Pena Lane, PV5, PV4. Our main model is located at 422 McCulloch Blvd S.